Kalady a tiny village on the right bank of the River Pariyar, is the birth place of Sri Shankaracharya, one of India’ s great philosopher-saints, who lived in the 8th century. 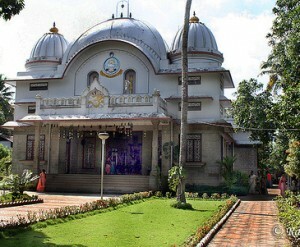 Among the notable places to be seen here are the Ramakrishna Advaita Ashram and the adjoining Sri Krishna Temple, which has a beautiful shrine modeled on the Sri Ramakrishna Temple at Belur Math. From the top of the tall 8-storey-high, brilliantly painted pink memorial, the Sri Adi Shankara Keerthistambham, one can have a splendid view of the surrounding palm-fringed fields. This entry was posted in Kalady, Kerala and tagged kaladi, kalady temple. Bookmark the permalink.